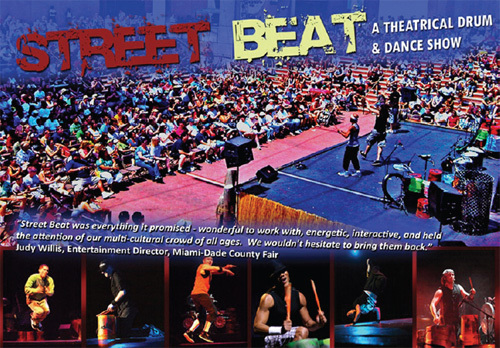 Street Beat – An Urbanized Journey Through Percussion and Dance. A kinetic, energetic explosion of live urban rhythms performed on found objects (from oil drums and hub caps to household items and junk), along with the pinnacle of modern “street” choreography, Street Beat brings the rhythmic originality of popular street-style performances together in a proven dynamic and thrilling production. This high impact drum and dance show will resonate throughout any festival or fairgrounds.and thrilling production. This high impact drum and dance show will resonate throughout any festival or fairgrounds.